Just as land-based casinos offer electronic gaming machines, sports and horse racing wagering options, and live table games, so too does BetOnline. The site, founded in 2004, has had only a few minor complaints and has proven a stronger reputation as of late, especially with the array of ongoing promotions on offer. 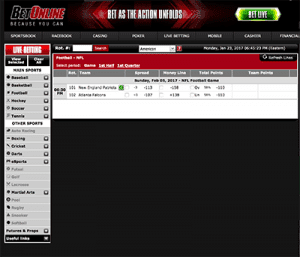 Overall, BetOnline is an ideal site for those after all-in-one a gambling site. Mac and PC users can install the poker software at BetOnline. BetOnline comes in a downloadable format and you can simply access all the gambling options via your web browser. While many online casinos offer a downloadable client, it is exclusively for PC users due to compatibility issues. But when it comes to BetOnline, both PC and Mac users can download the software. Unfortunately, the Mac download can be harder to locate than the PC link – the latter is the link along the top menu panel on the homepage. The Mac client can be downloaded via the FAQ website under the poker section and you can log in or register once installed. While the categories are all there on the downloadable format, for the Mac client you can only play the poker here. Every other category will open in a new tab via your default browser, such as Firefox, Chrome, or even Safari. If you don’t have the storage space, or don’t want to install anything, you can play via your browser. BetOnline is designed to target US punters, but players from all around the world can also gave a gamble or two here. There’s such a wide range of wagering options on offer too. BetOnline offers an array of sport markets which are incredibly popular in the US. Players can wager on the main markets such as baseball, basketball, football, hockey, soccer, and tennis. There’s also auto racing, boxing, cricket, darts, eSports, Futsal, golf, lacrosse, martial arts, pool, rugby, snooker, softball and more sports betting markets at BetOnline. Fill out the bet slip with your preferred punts and then deposit – or pre-deposit to save time – to confirm the bets. The Racebook is considered to be one of the best for those after thoroughbred and harness racing from tracks in North America. For new punters, there’s Racebook rules, as well as information on track limits and payout odds. You will also find tips each week on the site too. The wagering options include betting on a win, place, show, across the board, exacta, quinella, trifecta and more. Online casino section at BetOnline. 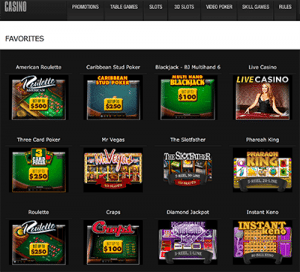 The casino accessed via the instant play platform offers a huge range of games. You will find over 20 blackjack variants, around six roulette variants, two craps options, a baccarat title, and an array of RNG poker if you don’t like the poker tournament vibe. The casino games are powered by NetEnt, BetSoft, and more with varying table limits. You’ll also find a huge range of pokies – including BetSoft’s line of 3D Slots – video poker and around five keno variants. There’s also a live dealer casino including live blackjack, roulette and baccarat, all powered by a lesser known live dealer casino provider, Visionary iGaming Software. But what really makes this online casino section of BetOnline unique is the addition of skill-based games. Players can gamble on Dominoes, Gin Rummy, Yahtzee, Spades and Tonk and win real money. BetOnline offers No Limit Texas Hold’em – there isn’t any Limit Hold’em here though – as well as Pot Limit Omaha found 24 hours a day. These two poker formats are the only available formats at BetOnline – players after stud, or mixed poker will need to go to another poker room. Rebuy, Freezeout, Freeroll, Turbo, DeepStack, and Pot Limit tournaments are available too. There’s around $250,000 in guaranteed prize money on offer each week too, with the weekend offering the biggest spread. There’s also Sit and Go’s which run all day every day in the No Limit Texas Hold’em format – you may find a few offering Pot Limit Omaha too. BetOnline has optimised their site for the mobile platform via your smartphone or tablet’s browser. Simply follow the links here on your Apple, Android, Windows, Blackberry or another portable device to get started. You can create account on your mobile or log in with your desktop details. Here you will find sports and horse racing to bet on, as well as a limited version of the casino as not all desktop games have been optimised for the mobile platform. Since BetOnline offers so many gambling options, there’s a number of welcome bonuses you can take advantage of depending what you’re there for. The sportsbook offers a 50% welcome bonus for new players when you make you first deposit. Use the code NEW2500 to receive up to $2500 in free plays to use on the sportsbook – there is a wagering requirement of 10x. When it comes to the casino section you can get a 100% matched deposit bonus of up to $100 to use on the pokies at BetOnline – but there’s a huge 50x wagering requirement attached so it might not be worth it. 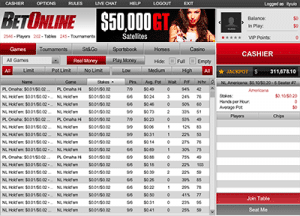 The poker section also offers a 100% welcome bonus, with $5 released into your account at a time – use the code NEWBOL. This is just some of the huge number of promotions on offer at BetOnline, all available to view under the promotions tab via your web browser. Be aware that terms and conditions apply, including high wagering requirements, user restrictions and more. Only players 18+ are eligible for bonuses and real money play. Always gamble responsibly. Deposit options available at BetOnline in USD only. 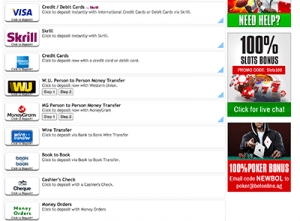 BetOnline offers your standard credit and debit card payment options, as well as e-Wallets and bank transfers, but there’s a few unique payment methods too. It is important to note BetOnline only accepts USD – this means you need to take note of any conversion fees which will be incurred. All transactions – and every bet and movement you make on BetOnline – is secured by the latest data encryption technology. Click on the padlock in the URL to confirm – the details will reveal TLS certification which is the best technology to keep everything private and secure. BetOnline offers a live chat where you can speak to a customer representative 24 hours a day, seven days a week. You do need to be logged in for this feature, so you’ll have to create an account if you don’t have one.